I think I owe this book quite a lot. It’s about being a butch girl in a small town and navigating your identity and relationships in the light of that, and it helped me feel more certain than ever that I am, in fact, non-binary, and not just a butch cis girl. I mean, I’d been thinking this was probably the case for quite a long time, but I don’t really know many butch people IRL, and so it was difficult to know what my feelings were doing. Reading this, though, helped me realise what I don’t feel, which is any meaningful connection to the idea of womanhood. So I owe it for that. Other than that, however, I’m not sure how to rate this book. It took me a long time to get into it, and my confusion influenced my mood for a long time. I struggled to get to grips with what was going on, and who all the characters were: there are a lot of them, and many of them have nicknames, so I spent the first 20% of the book extremely confused. Part of this was also because small town life, especially American small town life — in quite an alien concept for me; pretty much everything I know about American small towns is based on Gilmore Girls, which may not be 100% accurate. As a result, it took me a long time to wrap my head around the dynamics of the setting, and there’s a lot of emphasis on esoteric local traditions that, as a reader, you know nothing about, so it takes a while for you to understand why you’re supposed to care about them. That said, to a certain extent I did start caring about them, although it took a while — I may have struggled to engage with the book for about a quarter of it, if not longer, but something eventually clicked and I began to follow the plot a bit better. I never got as invested in the characters as I wanted to, but I started to care enough to want to know what happened. 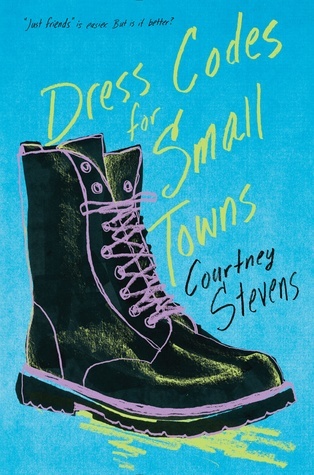 Moreover, it was refreshing to read a queer book that featured an explicitly Christian character — Billie’s dad is the minister, and there are quite a few scenes that take place in youth groups and Bible studies. These aren’t a big part of the plot and they’re not the cause of any particular angst: they’re just the setting of Billie’s life. She may not always get on with the church as an institution, but she’s still a Christian, and her story doesn’t revolve around angst and rejection. As someone who grew up Christian and whose teenage years also featured a lot of youth groups and socialising in explicitly Christian settings, I hadn’t realised how rare it was to see this in books until I actually saw it. It seems like most queer books with a religious aspect have to make it into an angst-ridden big deal, whereas while my faith definitely contributed to my uncertainty while I figured out my identity, it was never as clear cut as that. There were also some great friendships and interpersonal dynamics in this book: it’s got quite a detailed ensemble cast, which may have contributed a lot to my early confusion and difficulty following what was happening, but it ended up being one of the book’s strengths. I think if I’d found it easier to get into, I would have enjoyed Dress Codes for Small Towns more. I’m not sure I would have perservered past that early confusion stage if it hadn’t been a review copy, and therefore it might not have had the chance to win me over — in my opinion, that’s definitely a weak point. I think it’s losing stars for the confusion, but were it not for that, I might have liked this a whole lot.